The horseshoe crab is a strange, ancient creature that has been around since before the dinosaurs. 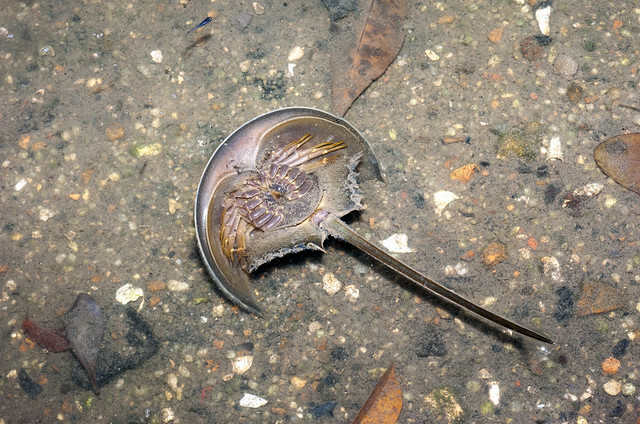 Singapore is lucky to have two kinds of horseshoe crabs, but they are on our endangered animals list. Coastal horseshoe crabs seen at Sentosa. 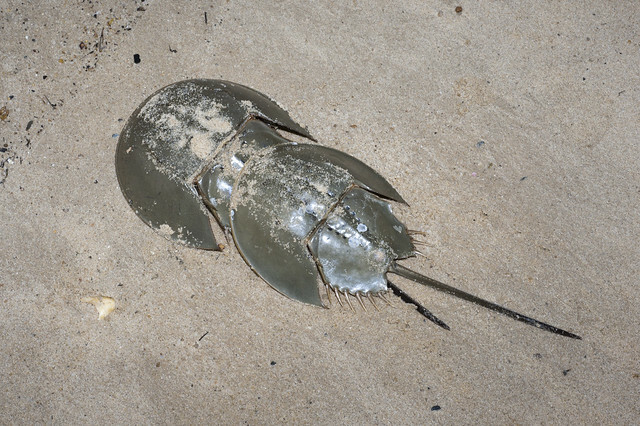 Singapore scientists, however, have developed substances to ease pressures on wild horseshoe crab populations, and young students have developed a method to rear horseshoe crabs for release to the wild. You too CAN make a difference for them by volunteering with the Horseshoe Crab Rescue and Research programme by the Nature Society (Singapore). Their next session is on 25 Mar (Sun). 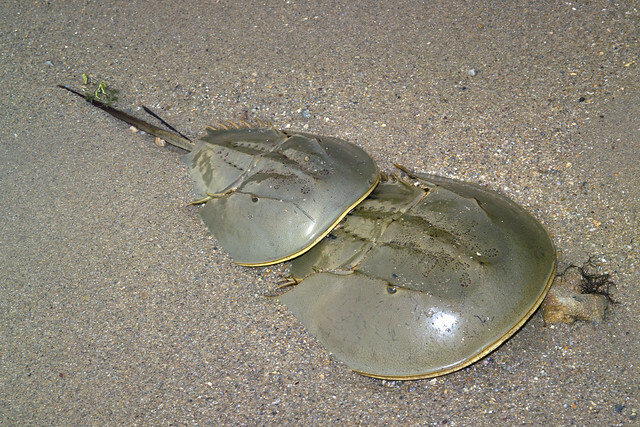 The horseshoe crab's shape is ideal for bulldozing through the mud and sand, and clinging to the bottom in rough water. It probably got its common name because its shell resembles a horse's hoof. Here's a video of a pair of horseshoe crabs burrowing into the ground. Singapore has two of the four species of living horseshoes crabs in the world. 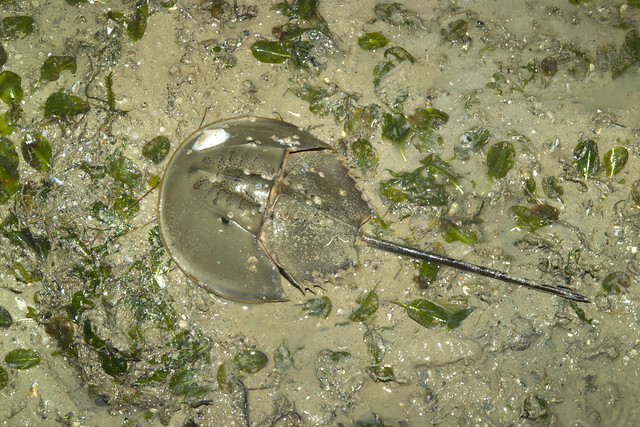 The Mangrove horseshoe crab which is also the smallest horseshoe, and the Coastal horseshoe crab. Horseshoe crabs are technically not crabs or even crustaceans. They are more closely related to spiders and scorpions! seen on the seagrass meadows of Changi. The sharp tail of the horseshoe crab is not venomous and is not used as a weapon. The tail is used as a rudder when moving underwater. If a horseshoe loses its tail, it is doomed. So please don't dangle a horseshoe crab by its tail! The tail is also used as a lever to right itself if it is overturned. If you see an upside down horseshoe crab struggling with its tail waving around, do give it a helping hand. It will not hurt you. 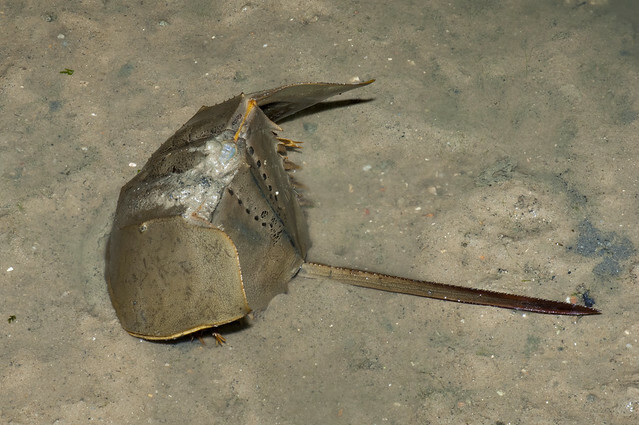 A horseshoe crab has no jaws and can only eat while it walks! It has to grind its food with the spiny areas on its walking legs. Walking movements grinds up the food and the bits flow into the mouth! A harmless creature, the horseshoe crab bulldozes quietly along on the sea bottom feeding on worms, clams and anything edible including dead animals. They may also scrape off algae. on the underside of a horseshoe crab. Horseshoes mate during high spring tides when they can reach the highest part of the beach. The males are smaller and usually hitch a ride on the females using their specially adapted hooked first legs. The female digs a pit near the high water mark and lays about 200-300 eggs. 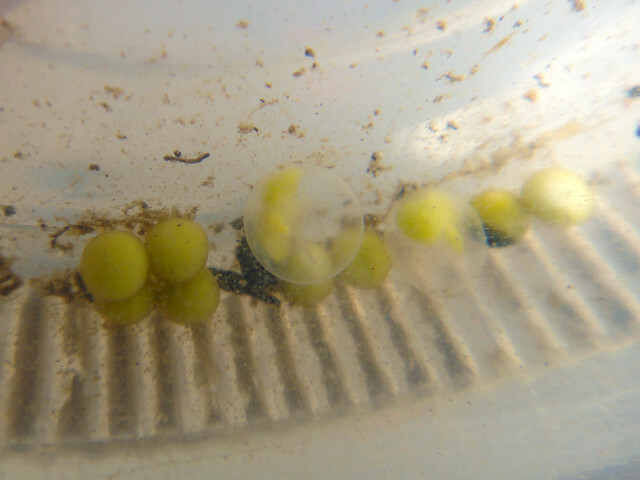 The males release sperm over the eggs and the nest is covered. seen on the high shore at East Coast Park. Eggs hatch at the next full moon when the tide is at its highest again. during the Mega Marine Survey. The hatchlings look like miniature adults but without tails, and are bright green! The larvae burrow into the sand and after a few moults begins to develop tails. In 2017, ITE College West students developed a system to rear wild-caught eggs into juveniles for release into the wild! A tiny horsehoe crab which has already developed a tail. 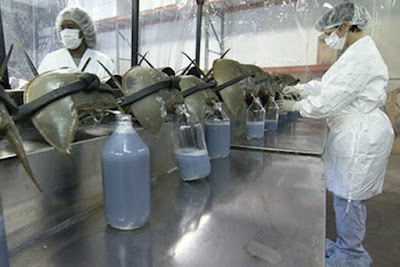 Horseshoe crab blood has a substance that is so sensitive to bacteria that purified extracts of the blood are used to test for the presence of bacteria in human medication (e.g., intravenous fluids) and in medical tests. About 200,000 crabs are bled every year for this substance. About 20% of a horseshoe's blood is extracted and in the US, laws require that the animal be returned to the sea. But about 10% die in the process. A still from the PBS Nature documentary Crash PBS. In 2004, a team from the National University of Singapore has cloned a substance (Factor C) to replace wild-extracted horseshoe blood! Populations of these ancient creatures in Singapore have been severely reduced over the last two decades due to habitat loss. 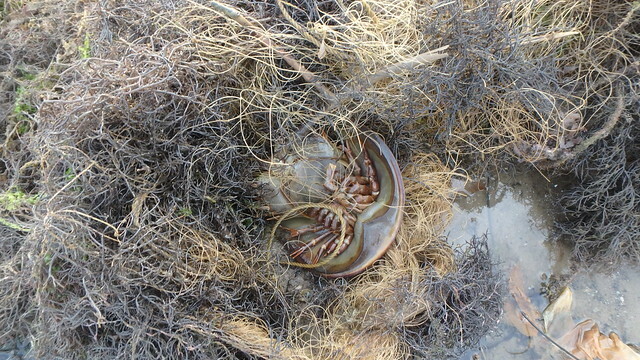 Accidental trapping in nets also takes out huge numbers of horseshoe crabs. trapped in a net at Chek Jawa. 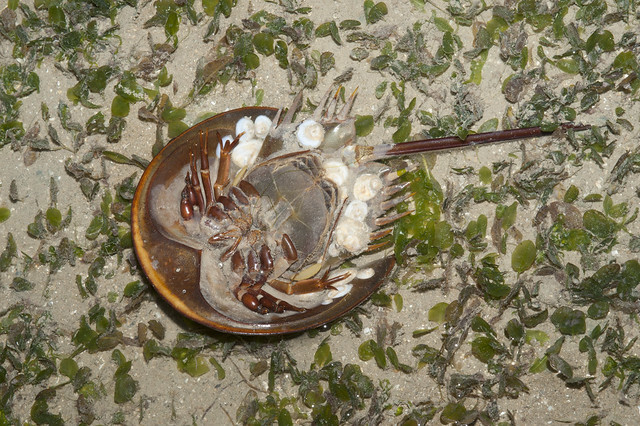 Horseshoe crab populations are vulnerable to overharvesting because they reproduce slowly. Few hatchlings make it through the natural predator net, they reach sexual maturity only at 9-12 years and are rarely found far from where they were born. There are so many of them only because they live for a long time, some up to 20-30 years. Horseshoe crab trapped at Labrador. 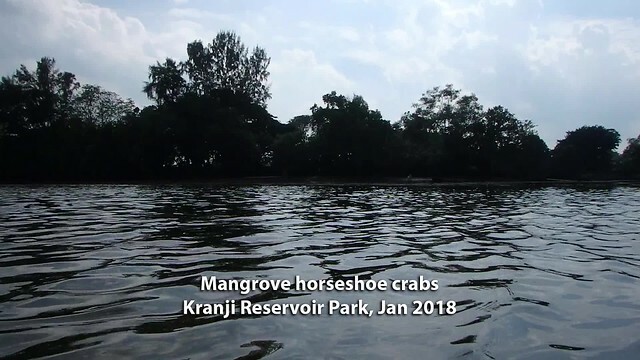 Volunteer with the Horseshoe Crab Rescue and Research programme by the Nature Society (Singapore). Their next session is on 25 Mar (Sun). Families are welcomed! Thanks to Liz Lim for a glimpse into what happens during a typical Horseshoe Crab Rescue and Research session. 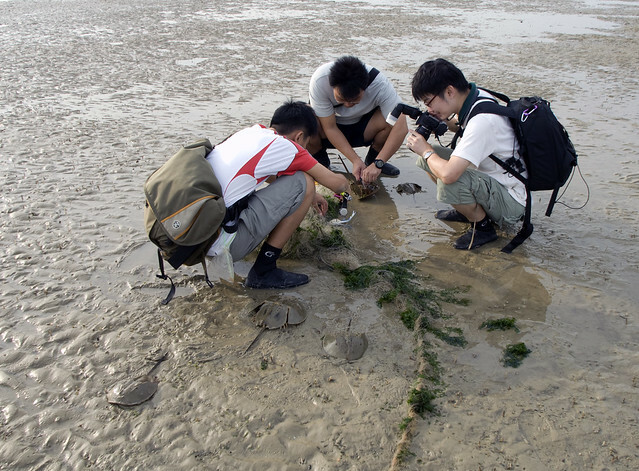 Horseshoe Crab Rescue and Research by the Nature Society (Singapore). Saving Lives - Humans and Horseshoe Crabs! on the NUS Enterprise website. Labels: citizen science, marine science in singapore, shore highlights, singapore got marine life meh?